Washington, D.C. - The U.S. Botanic Garden (USBG) presents Orchid Spectrum from February 23 through April 8, 2018. This annual orchid exhibit, in partnership with Smithsonian Gardens, highlights the world's largest plant family and the USBG's most extensive plant collection. Found on every continent except Antarctica, orchids showcase a wide spectrum of diversity in color, shape, size, habitat, scent, and many other aspects. Explore thousands of amazing orchid blooms arranged in captivating displays, and appreciate many unique, rarely seen orchids from the USBG's and Smithsonian Gardens' extensive plant collections. The exhibit celebrates orchids through a large orchid arch filled with over 700 orchids, a hanging curtain of colorful orchids overhead, a large orb made from 90 orchid plants, more than 1,000 orchids mounted vertically on palms and columns in the Tropics house. 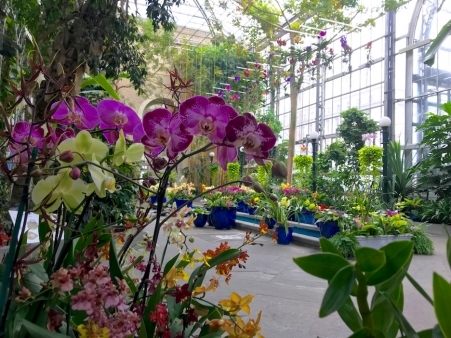 Throughout the Conservatory, discover stories such as orchid fragrances from enticing to grotesque, the diversity of orchid habitats, conservation of rare and endangered orchids, the spectrum of North American native orchids, modern orchid growing techniques, and more. During Orchid Spectrum, the U.S. Botanic Garden will offer orchid-themed programs and activities for adults and children, including orchid care demonstrations and workshops, art and photography workshops, lectures on orchid diversity, conservation, and more. Visit www.USBG.gov/OrchidSpectrum to learn more about the exhibit and associated programs.